More than $2 billion left investment grade bond funds in the week that ended on June 17, and $4 billion left high-yield debt funds, the highest outflows from this asset class since December. But this is just a drop in (or rather, out of) the ocean. Since 2009, inflows into bond funds have totalled $1.2 trillion; only $573 billion went to equity funds in the same period. Emerging market debt funds, which had taken a battering since the markets begun pricing in the Federal Reserve raising interest rates, saw surprisingly small outflows in the week that ended on June 17, of only $200 million. Government bond funds saw their eighth straight week of outflows, worth $2.8 billion. It was the longest streak of outflows since October 2013, in a sign investors are accelerating their rotation out of the asset class. 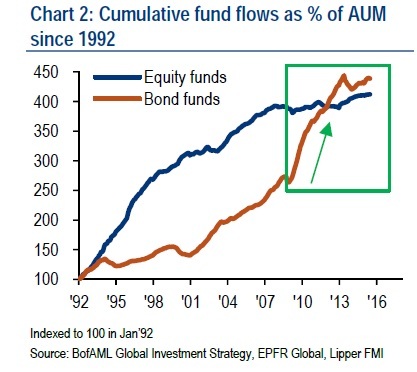 Over the past six years, just 6% of assets under management went into equities, while bund funds have seen 66% of AUM in inflows. But in the past week, equities saw the largest inflows in three months, worth a net $10.8 billion; about $15 billion was invested in ETFs; around $4 billion left mutual funds. Geographically, US stocks saw the largest inflows in 13 weeks, up to $6 billion, followed by Japanese equities with $3.5 billion. European equities — until not long ago “the consensus darling” and “the crowded trade” – saw the largest inflows in four weeks at $1.8 billion, but the lowest of the all the regions. Emerging market equities, which had been shunned by investors for a long time, saw healthy inflows worth $2.2 billion (mostly via ETFs). In a recent investor survey carried out by Bank of America Merrill Lynch, most respondents said Latin America was the biggest opportunity among emerging markets in fixed income. The survey was carried out among by 57 asset managers with more than $270 billion in AUM, in the June 15 – June 17 period.